At some point recently the DIA, which the FOIA requester community has often viewed as rather tight-fisted, added to its FOIA Reading Room an extremely valuable resource in the form of the Standing Operating Procedures for the Combined Media Processing Center-Qatar, the primary facility for document exploitation operations for documents seized in Iraq. The DIA's link to the document is here, but I have also reposted that document here (and due to some odd formatting issues in the DIA's original I have also posted a printed, rescanned and searchable OCR'd version here (warning, both versions are large files)). The significance of the document comes from its exceedingly detailed (and completely unredacted) coverage of the processing of captured documents, including the use of the DOCEX Suite, the assignment and meaning of HARMONY numbers, and the triage and translation process. As far as I am aware this level of detail has never been released publicly anywhere before. On a first reading, the single most significant part in my view is Appendix D, which provides detailed and substantive Triage Guidelines. 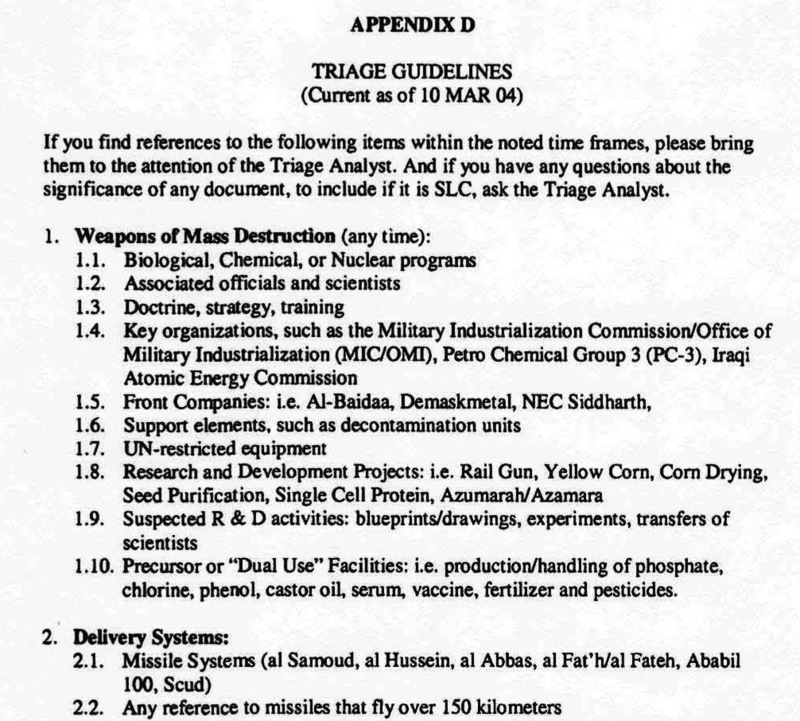 These are prioritized subject categories that reviewers were supposed to be on the look out for when reviewing the documents (for more on Triage, called "the most critical step in the exploitation process," see Section 2.3). Appendix D notes that its guidelines are current as of March 10, 2004. Unsurprisingly, the first Triage Guideline category is WMD. Others include "Regime Strategic Intent," "War Crimes and Crimes Against Humanity," "Counterintelligence Information" (including "Information on Australian, British, Canadian, and U.S. Nationals"), "Terrorist Organizations and Operatives" (in which is included "MOIS/IRGC/SCIRI/BADR Corps"). Another rather interesting category is "Procurement" which focuses on "Business deals with domestic and foreign companies," "Australian and British persons, entities, and corporations," "Financial records from Jordan, Iraq, Lebanon, and Syria," "U.S. persons, entities, and corporations," and "Contracts, offers, or tenders from North Korea, Pakistan, India, Libya, South Africa, Yemen, Turkey, European countries, and former Soviet states." An interesting omission from the triage categories is information about Kuwait's missing national archives, which is noteworthy because, according to a 2003 report by the U.N. Secretary General, the United States informed the Security Council that it had established a "special group" that was "entrusted with searching for the stolen Kuwaiti archives." The same "special group" was also tasked with searching for "Kuwaiti and third-country nationals missing since the Gulf War" which is explicitly covered in the triage guidelines under "Prisoners of War from the Gulf War." There is also a sub-category for "Scott Speicher" and the DIA has also recently uploaded to its FOIA page an extensive report on the Iraq Survey Group's support to the CAPT Speicher investigation. Other aspects of the CMPC's SOP will be highlighted in future posts, but one final aspect worth mentioning is that at the very end of the electronic file is some bonus coverage in the form of powerpoint slides from 2008 regarding "Integrated Linguist Activity - Doha" or "ILiAD" including the role of the DIA, the CMPC, the Open Source Center, and the National Virtual Translation Center.